There is no way to slow the hands of time, and as you age, there is no proven way to stop the metabolic decline. Your metabolism slows as you age, meaning you aren't burning calories as quickly or efficiently. Women over 50 who need to lose weight must not only control calories but increase activity as well, which has proven health benefits beyond weight loss. Although food science is a rapidly expanding area of study, and nutritionists understand that different calorie sources affect weight loss in subtle ways, there is still a bottom-line, no-nonsense way to lose weight for all dieters, young and old: Burn more calories than you take in. This is usually achieved through a combination of diet and exercise. In late middle age, women who reduce calories and add activity have a far greater chance of success than those who rely on diet alone, according to a study by Karen Foster-Schubert of the Fred Hutchinson Cancer Research Institute in Seattle. One pound of fat equals 3,500 calories, according to MedlinePlus, a division of the National Institutes of Health. To lose just one pound per week, you must either reduce your calorie intake or increase your daily activity by an average of 500 calories per day. The maximum safe weight loss rate for younger adults is 1.5 to 2 pounds per week, but seniors and those in late middle age must be wary of malnutrition due to a drop in metabolic activity. A safe goal for older adults is one pound per week. 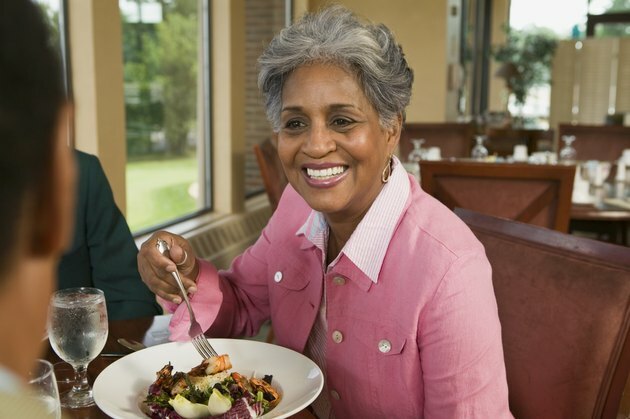 Older adults on a weight loss program should balance the diet with plenty of protein, dairy and fiber sources and plan small meals four to five times per day rather than one or two big meals. To get the maximum nutritional benefit, doctors across the board recommend severely limiting caffeine and alcohol while including fruit and vegetable sources rich in vitamins, minerals and antioxidants. In the Foster-Schubert study, four groups with an average age of 57 participated in the experiment. One spent six months on a diet and exercise program, another focused only on diet, the third concentrated on exercise only and a control group did not change their daily habits. After one year, the diet and exercise group far outpaced the others in total weight loss, dropping an average of 21 pounds. The combination of diet and exercise is not only effective in older adults for safe weight loss, but also improves health outcomes related to circulatory and pulmonary problems and slows the rate of metabolic decline, according to Help Guide, a nonprofit organization dedicated to health education for everyday people.